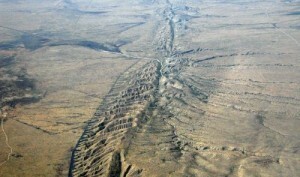 Recently, scientists have detected a far-reaching movement of the famous San Andreas Fault in California. The San Andreas Fault Line runs all throughout California, slicing it into from Cape Mendocino to the Mexican border. For years, the plates have been moving at a constant rate, but this time around, the line activity is alarming. Large tracts of land have been moving either upwards or downwards at average rate of 2-3 millimeters annually. Nowadays, the changed city landscape is enough proof that the San Andreas Fault Line may be very unforgiving. The fault is recognizable by the series of pressure ridges. Areas like Orange County, San Diego County, the Los Angeles Basin and the Bakersfield region are notably sinking. On the other hand, places like San Luis Obispo County, San Bernadino County, and Santa Barbara County are rising sweepingly. A total of 125 miles-wide area is vulnerable to forecasted earthquakes or a major quake. Further, experts have already foreseen these circumstances, but due to lack of state-of-the-art equipment, the extent of possible damage was undetermined until today. Though the San Andreas GPS data had been available for more than a decade, it was unable to eliminate impeding factors such as noises from precipitation and surface geology. The arrival of modernized gadgets enabled the researchers and scientists to distinguish a clear path and pattern of the said fault. Residents of California and of the nearby states such as San Francisco and Los Angeles are trembling in fear of the next big earthquake caused by the fault. To date, the last major catastrophe caused by the moving plates was more than a century ago, in 1906. It has left majority of the people in the streets and killed an estimated 700 to 3,000 citizens. For this reason, geologists believe that a massive earthquake is overdue in these areas. Experts gauged that a 7.0 – magnitude earth tremor might hit the region in the next 30 years. One of the fears of the locals is the possibility of a tsunami, as what is frequent in Japan succeeding every quake. Fortunately, the San Andreas Fault is located inland and far from the coasts; thus not directly linked to the ocean floor. Additionally, the fault won’t result to a giant gorge also because of its location. Yet, California will still be in great peril, as it sits atop on dozen minor earthquake faults. Seismologists have no exact date, but rest assured that a “big one” is bound to happen. In the meantime, Californians are advised to start preparing now for whatever that may come.